Full directions after the break. Draw whatever crap you want 3D printed on a separate EAGLE layer. I used the “Housing” layer (248). This gives us an EPS file (a form of PostScript) with the 2D figure. Next, we use Inkscape to turn this into an OpenSCAD 3D design. Install paths2openscad. 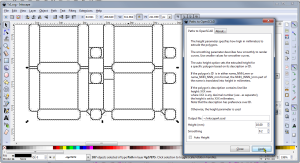 Download and extract to “%APPDATA%\inkscape\extensions” (Windows) or “~/.config/inkscape/extensions” (Linux/Mac). Press Ctrl+A to select all pieces — they should all highlight separately. From the Path menu, select Stroke to Path. It will think a bit to turn all those lines (which are 1D strokes with thickness) into paths (which are true 2D forms). 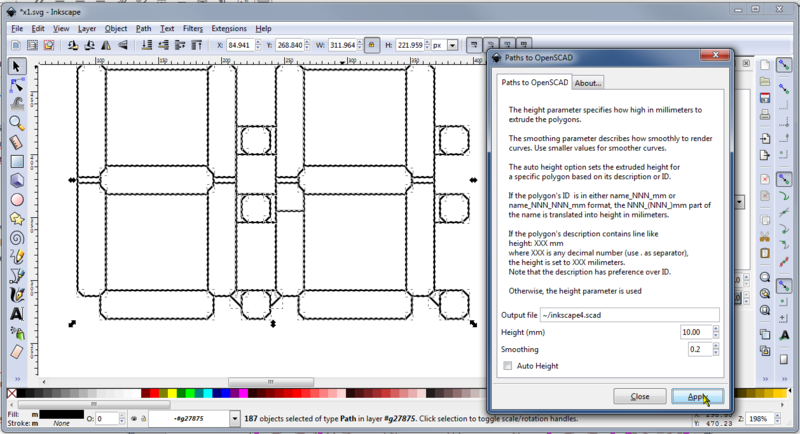 From the Extensions menu, select “Generate from Path” > “Paths to OpenSCAD”. Accept the defaults, setting height as you see fit. 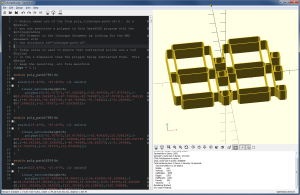 Export the OpenSCAD file. 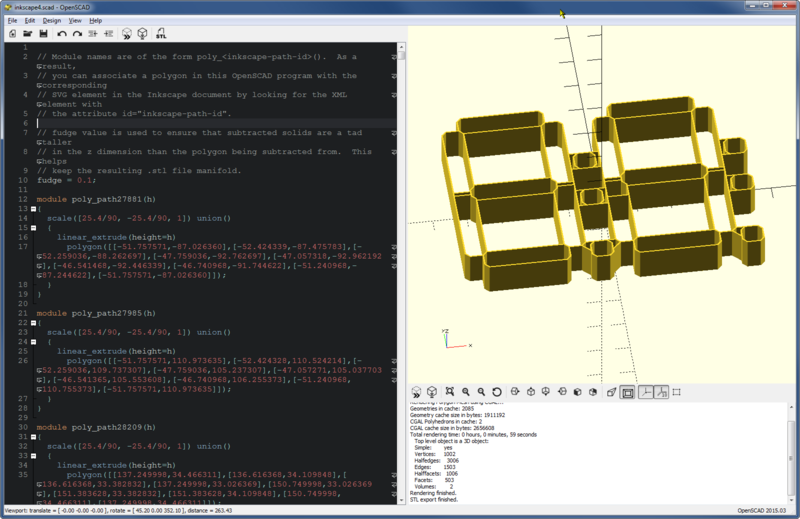 Now we have an OpenSCAD script. Then just 3D print it up! For this particular thing, I set my line width in EAGLE to 0.016″ (~0.4mm), which is the size of my 3D printer’s nozzle. That meant that every line was a single pass of the printer. EAGLE can export a DXF file, and OpenSCAD supports import of DXF, so you might think you can skip the whole Inkscape nonsense. 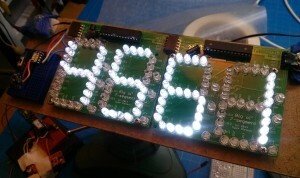 Not so — EAGLE uses DXF commands that OpenSCAD doesn’t understand. 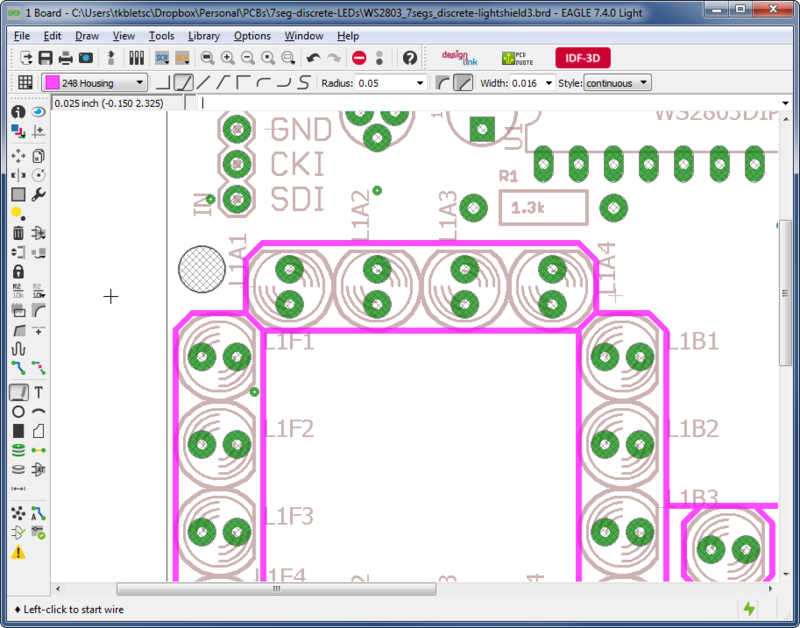 Similarly, Inkscape’s DXF import also chokes on EAGLE DXF files. You might think you could somehow post-process the DXF into a more normal format and extrude it using another CAD package. This is probably possible somehow, but all the toolchains I tried failed at one point or another. 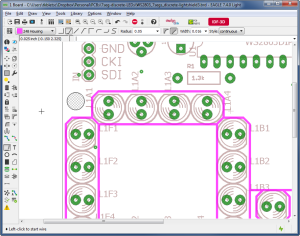 Converting DXF using QCAD didn’t work, despite QCAD supporting like 20 flavors of DXF. Converting from DXF to SVG using QCAD worked, but then my “trial” of that feature expired, as if exporting to SVG is worth 33 freakin Euros. You can do QCAD DXF import -> QCAD PDF export -> Inkscape import, but it’s long and awkward, especially with QCAD’s weird handling of units. Many 3D CAD packages’ attempts to load the DXF would turn it into a pile of rods, ignoring the whole “lines that make up the shape” aspect. I’m looking at you, TinkerCAD. Online web-based format converters often butchered the form entirely. I tried to use Blender HAHAHAHAHAHA what a nightmare. FreeCAD is a literal warcrime.